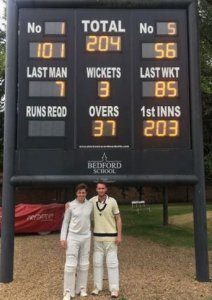 On Sunday 25th June the Old Bedfordians progressed to the Quarter Finals of the Cricketer Cup with a comfortable seven-wicket win over the Felsted Robins. Having won the toss and opted to bowl first, Harry Aitkenhead (06-12) picked up two early wickets with the new ball and restricted Felsted well along with Mark Gibbs (93-98). At 63/2, the introduction of Shiv Patel (04-15) changed the complexion of the innings though with his cunning off spin reducing Felsted to 88/6 as he took four wickets for just one run in his first six overs. He finished with outstanding figures of 4/18 and, although Felsted staged a minor recovery to post 203/9 at the close, the Old Bedfordians were more than happy with their work. The chase never really looked in any doubt as opener James Kettleborough (00-11) was joined by Christian Davis (00-11) at 85-3 and the pair looked in little trouble as they knocked off the remaining runs in an unbeaten partnership worth 119. Kettleborough finished a superb 101 not out and Davis ended 56 not out, including a six to win the game. The Old Bedfordians now face a trip to Marlborough College in the Quarter Finals on Sunday 9th July…all support would be most welcome! * photo: James Kettleborough and Christian Davis following their 119 run, match-winning partnership.